Well... I truly feel like a seasoned traveler. And by seasoned, I mean with dust and dirt and sweat and sunscreen and bug-spray. 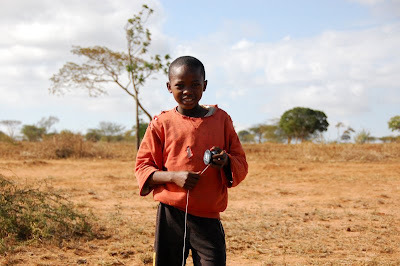 But surprisingly Kenya has been way more fantastic than I ever expected. It's hard to explain (as it is always hard to explain to people when you've been somewhere they have not). Everything is better than I expected - which is fantastic. People are kind and speak English everywhere. It's much more lush than most Americans might expect. All those movies/images we get at home made me think all of Africa was dry desert!! The people are very modern, intelligent and forward thinking too too. I know, I know - typical "superior American" viewpoint I have. But that's why it's so important to travel!! 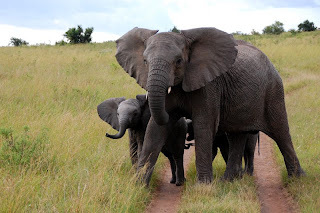 the famous tusks that are the symbol of the city. 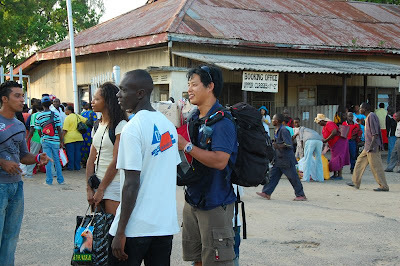 We took an overnight train from Mombasa to Nairobi. That is for real the train station back there! You'll notice I'm wearing the headwrap/bandana in most pictures. Lemme tell you - you wouldn't want to see what's under there!! It was hot and humid in Mombasa. I just wanted to shave my head! 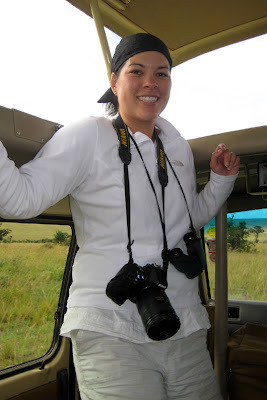 And I now see why people look so "weathered" after being on safari. It's a dusty mess! We took the overnight train from Mombasa, Kenya to Nairobi. It's only about 400 miles but the train took like 14 hours. I think it moves about 50 MPH. It was a living hell (literally) the night we got on. It must've been about 90° inside the train and the air barely moved. There were fans in the train but they wouldn't work!! We were seriously dripping sweat into our dinners on the restaurant car. But after a semi-restless sleep we awoke to some BEAUTIFUL landscapes. We were traveling past these little villages. People literally lived in small huts made of mud and straw. They owned goats and cattle and grew corn. And every time the train would stop at a station, the local children living in the huts nearby would run up to the windows hoping we'd throw things out. just started moving but he was still "flirting" for a free gift. Even with the yo-yo he already got from us! At an especially long stop, we actually climbed off the train to be more among the children. We handed out some American granola bars and small toys some of our group was smart enough to bring along. It was very humbling. They are "required" to go to school, but many can't afford it. 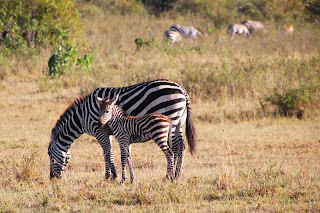 We also saw our first zebras from the cars of the train traveling through the Kenyan countryside. ZEBRAS!! 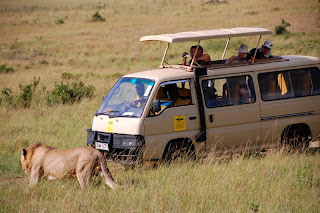 After spending a night in Nairobi we left for our safari in Masai Mara. It was in the top 3 things I've done here in Africa if not #1! 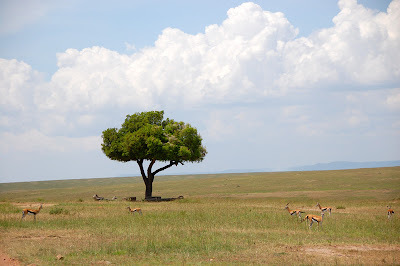 How exciting was it to see wild elephants and wild zebras?!! We drove 5+ hours in a non-AC bus on a BUMPY and DUSTY road (of course that means 5 hours there and 5 hours back!) but it was so well worth it. To see these animals RIGHT in front of you and know that they are completely wild - UHMAZING! 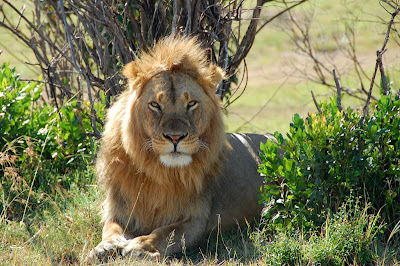 Masai Mara is known for their almost guarantee of spotting the Big Five Animals: Lion, Leopard, Elephant, Buffalo and Rhino. We unfortunately didn't see a leopard or a rhino, but we did spot something usually evasive: a cheetah. She was in the middle of her hunt. Beautiful! You don't mess with a wild cat on her hunt!! That little cub was so adorable!! 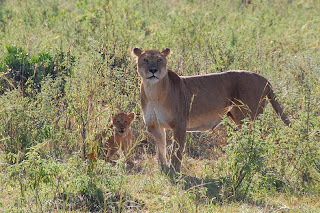 The other animal I was dying to see and even see more of than we saw - lions. Wild lions!! 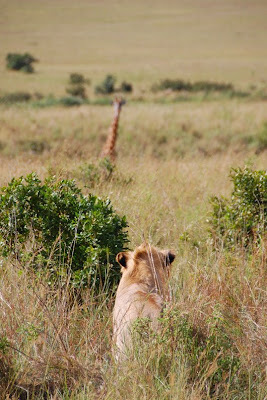 We spotted a mother and her baby yesterday morning, a couple of males "relaxing'" and later, 3 males hunting a giraffe!! That was unbelievable, and apparently rare to catch them hunting. Especially males! Just to show you how close those animals often come to our vans. We ate a picnic lunch under that tree - how fantastic is THAT? You had a picnic in the middle of the "jungle"?? Gutsy! Un-flipping-believable. SO COOL!!!!! I may have to just take that trip to Africa this summer regardless of my situation. What an outstanding experience. Your pictures are fantastic, and made me a little teary, knowing I don't even have a clue as to what an adventure you are on!!! Wow... amazing pics, Lise! 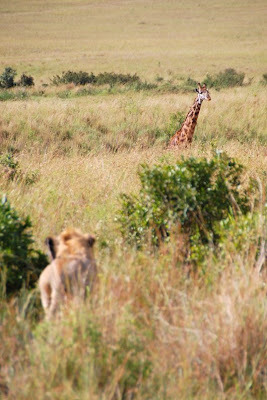 Haven't had the desire to travel to Africa, but now I'm intrigued... glad you're having such a memorable trip. i LOVE all of your photos, lise! and really glad that you're having such a wonderful adventure. i know you're heading back soon and wish you safe travels back -- can't wait to hear about everything.